Four years ago, those seeking refuge at Grove Street Inn spent about four to six weeks on the shelter’s waiting list. Now, that wait is closer to eight weeks, or 10 during the winter, according to Katie Miernecki, director of the ServiceNet Hampshire County Shelter & Housing Division. 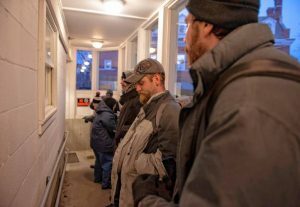 Joshuin Laduke , at center, waits with Pete Most, right, and others for the Interfaith Emergency Shelter to open its doors Thursday night in Northampton. “They need to expand this, when the space runs out where do people go,” Laduke said. 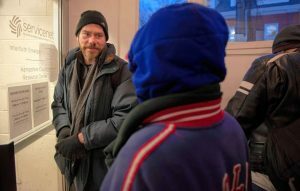 At Grove Street Inn, Miernecki said that shelter staff tries to accommodate everyone when the temperature drops below 15 degrees, filling the shelter beyond it’s 21-person capacity. The shelter is closed during the day and accommodates people for up to three months. But staff have to turn people away “almost every night that it’s not below freezing,” Wren said. Currently, around 80 people are on Grove Street’s waitlist, also representing a rise from the usual. And Grove Street Inn isn’t alone in this struggle. Staff at other shelters in western Massachusetts have also noticed an increased number of people on their waiting lists, said Jay Sacchetti, senior vice-president of Shelter & Housing of ServiceNet, a Northampton-based mental and human services organization that manages shelters in Northampton, Greenfield and Pittsfield, including Grove Street Inn. ServiceNet only tracks people who stay in the shelter, which does not include individuals who enter the waiting list but find housing elsewhere from their data, but Sacchetti said that staff have noticed an increased amount of people on the waiting lists. These increased waiting times are also notable in light of a report released by the U.S. Department of Housing and Urban Development (HUD) last month showing that Massachusetts experienced the highest hike in homelessness when counts were taken in Jan. 2018. While the national homeless rate rose by .03 percent, homelessness in Massachusetts spiked 14 percent, according to the report. 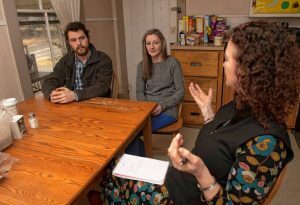 Josh Wren, a Peer Housing Specialist at Hampshire County Resource Center, Katie Miernecki , Director of Hampshire County Shelter and Housing Division, and Amy Timmins, the VP of Community Relations for Service Net, talk at The Grove Street Inn about the state of the homeless in Hampshire County. This spike was partially attributable to evacuees taking refuge after Hurricane Maria, said Andrea Miller, homeless management information systems analyst for the Three County Continuum of Care. In Hampshire, Hampden, Berkshire and Franklin counties, 1,120 Hurricane Maria evacuees were sheltered in the region by the Federal Emergency Management Agency. But an additional 2,899 people experienced homelessness across the four counties in total, with 11 percent or 307 of these people counted in Hampshire County. While it’s a complex situation, Sacchetti said that a standout problem is a lack of affordable housing. “There was a time that you could get a room for $350, $400, and that person could manage their life,” Sacchetti said. But in recent years, Sacchetti said this situation has become increasingly rare. At the state level, Pamela Schwartz, director of the Western Massachusetts Network to End Homelessness, said that data has shown that for every 100 extremely low-income people, just 46 affordable housing units are available. While low income is a “critical factor” in homelessness, Schwartz noted that various other factors such as addiction and mental health also drive homelessness rates. Pete Most, left and Alphonse White wait with others for the Interfaith Emergency Shelter to open its doors Thursday night in Northampton. If an individual can’t find housing in dangerous temperatures, Wren, who was homeless for about two years after graduating high school, said that he tells people to call 911. “This is a public health crisis,” he added. Miernecki also said that people can sit in police station lobbies at night. But dangers other than the cold come with a lack of housing, Wren said. While Massachusetts statistically experienced a rise in homelessness as a whole last year and demand on individual shelters remains high, Schwartz said that there is also reason for optimism. According to the HUD report, Massachusetts was one of four states sheltering at least 95 percent of the homeless community. In addition, Massachusetts is the only “Right to Shelter” state in the country, which protects families in crisis who meet certain criteria. Schwartz cited initiatives like the “Housing First” program, which prioritizes finding permanent housing over shelters, as efforts to end homelessness in the region.